Mason, at the age of 17 months, was diagnosed with Juvenile Dermatomyositis, a very rare auto-immune disease and has spent much of his young life in the hospital. He has had to fight for his life on a number of occasions. He suffered a perforated bowel due to the progression of the disease and the prescribed heavy steroid use. During surgery to remove a portion of his colon, it was discovered that he also had an enlarged heart. The prescribed steroids had also resulted in high blood pressure, a suppressed immune system, cataracts and pneumonia which left him with a scarred lung. 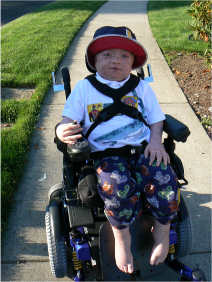 Over the past few years, Mason has continued to get weaker and is now in a wheelchair. He has lost the use of all but one limb, his right arm, but he remains a strong and loving little boy. In his short time on this earth, he has endured more suffering than many of us will in our entire lifetime yet he is still funny, witty and positive. He has a strong presence and an optimistic attitude. His dad will push him in the half marathon and together they hope to raise funds and awareness for this disease so that one day there will be a cure for Juvenile Dermatomyositis and no child will have to suffer its devastating effects as Mason has. It’s 4:45 a.m. at the starting line for the 2008 Carlsbad Marathon, also known as On The Roll For A Cure Marathon, for those who are in this race to fight back against a disease that has challenged them and their families. Melonie Applegate (pictured left with Paul) is tucking a blanket gently over her husband Paul Applegate, as he sits in his wheelchair. It’s cold and foggy in the pre-dawn darkness and everyone speaks in low quiet voices. Melonie knows this pre-race routine well as she has been here for the last four years in the same spot at the same time. 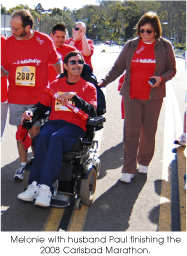 Paul Applegate was diagnosed with Amyotrophic Lateral Sclerosis, ALS, also known as Lou Gehrig’s disease, over four years ago, and since then was the lead marathoner for the Greater San Diego Chapter of the ALS Association. This year, again, a group of three PALS, People Living with ALS, will comprise a chapter relay team that will be pushed in their wheelchairs for a total of 26.2 miles. The “pushers” are family members, caregivers and friends of the PALS who faithfully show up every year eager to push their own marathon heroes. It is hard to find a dry eye anywhere when all three cross the finish line, some of them struggling and with assistance, to an enormous cheering throng. 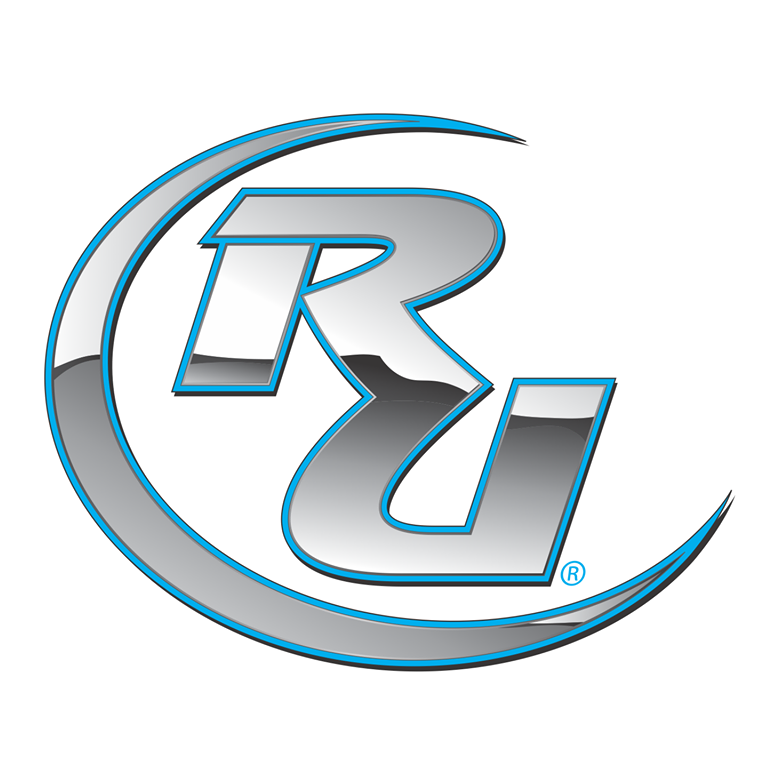 Pure raw courage meets with pure raw emotion and renders an inspirational finish. We lost Paul this past June, but Melonie will be here again in her usual spot, supporting those athletes who continue the battle against this disease. Melonie’s contributions to her husband and her family, and to the San Diego ALS Chapter make her a truly outstanding Hero for the Carlsbad Marathon. Melonie soldiers on in her own heroic way, although she is still uncomfortable with the title – Hero. Natasha Sandrock is running instead to honor the heroes who give live after death. She’s dedicating her fourth Carlsbad Marathon this year to one of the official charities of the marathon – Lifesharing – the organ and tissue organization serving San Diego and Imperial Counties. In 2002, two months before Natasha and her husband Michael prepared for their first marathon, Michael died suddenly from a pulmonary embolism. Natasha ran in Michael’s honor. “Our tragic situation turned into a blessing … a testimony to others,” Natasha said after completing the Carlsbad Marathon last year. 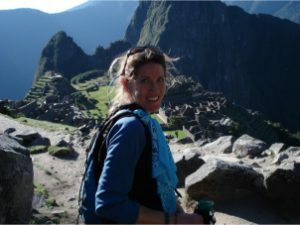 Since Michael’s death, this inspirational young widow has run more than a dozen marathons en route to her goal of seven marathons on seven continents. As an “extreme marathoner,” Natasha ran 3700 steps at the Great Wall of China, walked 10 days before starting the Mt. Everest Marathon in Nepal, scaled and then ran marathons on Machu Picchu in Peru and the Swiss Alps in Davos, and recently completed the Mt. Kilimanjaro run in Tanzania. Antarctica, Australia, Easter Island and Pikes Peak remain on her “To Run” list. Misty’s mother succumbed last year to the genetic killer that is Huntington’s Disease (HD). 29-year-old Misty, now runs in hopes for a future that will free her and her two young daughters from the same fate as her mother. Misty’s hope is for a cure so that her daughters, three-year-old Malia, and two-year-old Kaili, and her seven nieces and nephews don’t have to face the threat of HD. Already Misty’s older brother Jamie has HD symptoms. He has four children, all at risk. 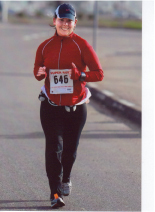 As part of her strategy Misty has been training to run the Carlsbad Marathon to raise funds for research. Some research indicates that running may prolong the onset of HD so Misty is running to help find a cure and to lessen the terrible impact HD has had on her family and many other families. Many years ago, when Rady Children’s Hospital was adding a wing to its facility, the employees were allowed to write a message in the tower. 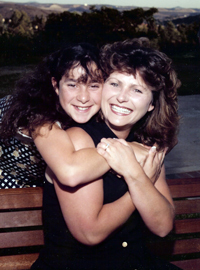 Kathleen Stark (pictured left with daughter Brittany) wrote a special message to her daughter, Brittany. Little did Kathleen know that years later Brittany would spend the final months of her life in that same hospital. Brittany was diagnosed with a heart condition that would require a heart transplant. She waited eleven months for the heart that never arrived, passing away at the age of fourteen. Kathleen, then a strong advocate for her daughter, still advocates today but in a different way. Kathleen often speaks at public functions, using a letter from Brittany as a vehicle to share Brittany’s eleven-month journey. Kathleen tirelessly speaks about the need for organ donation here in San Diego County. Among many charitable efforts, Kathleen has given years of service, bereavement support and compassion to parents of patients of Rady Children’s Hospital. This marathon marks the ten year anniversary of when Kathleen and her husband first ran in the Carlsbad Marathon in Brittany’s memory to inspire others and to create awareness of the need for organ and tissue donation. Kathleen will run the marathon again this year with her daughter Brooke to honor Brittany and the more than 1,400 San Diegans who have passed away while awaiting a life-saving organ transplant. David Kariuki has known many days when running meant survival. As an orphan, David grew up on the streets of Nairobi, Kenya where he ran for safety, ran to hide and ran to escape the dangers he faced each day. Running was a way of life. After many years on the street, David (pictured in the middle of the photo on the left) was rescued by a kind, generous man who used his financial resources to open an orphanage for children left abandoned and alone. Because of one man’s willingness to provide a home for the hundreds of children he found in need, David was given a chance in life. He was provided a safe place to live, food and an education. He was even able to pursue his dreams and by working hard graduated from university as a qualified Social Worker. He now serves other children left hurting and alone after the death of their parents. Working as Heart for Africa’s Country Coordinator in Kenya, David is able to impact the lives of many children in positive life-giving ways. He uses the knowledge he has acquired as well as his own life experiences to reach out to the children who are hurting and alone. David works to provide a safe place for children to live, grow, learn and thrive. No more running on the streets for David or for the children he cares for. Now running can be a means to raise awareness and provide for children. 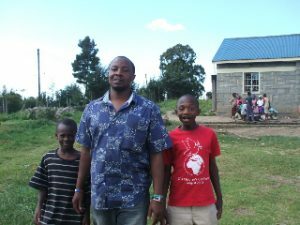 David is actually making his first trip out of Kenya to come here to be with us and to run his first half marathon. Bill was first diagnosed with Type I diabetes when he was sixteen. When most teens were worried about final exams or who to go to the prom with, Bill was worried about staying alive but he refused to let diabetes control his life. 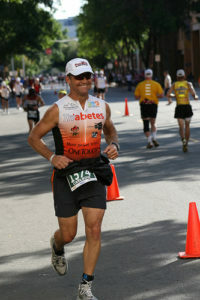 In 1983, he became the world’s first-ever diabetic Ironman triathlete when he competed in an Ironman Triathlon. Since that epic race, Bill has raced in 6 Ironman Triathlons, some 80 marathons, finished three 100-mile ultramarathons and sixteen 50-miles along with nearly 140 total triathlons.